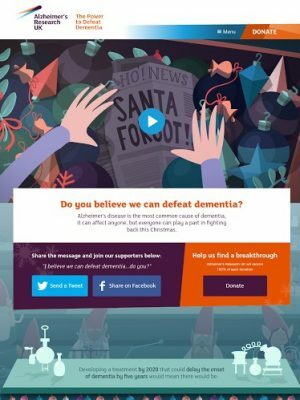 Reason Digital worked with Alzheimer’s Research UK (ARUK) on the digital launch of its successful Christmas campaign. Featuring an animated video by Aardman studio and a narration by Stephen Fry, the heartwarming #SantaForgot video features a girl who sets out to try and save Santa Claus, who can’t deliver presents anymore as he is suffering from dementia. Together with the elves, she decides that research is the way to save him, because “if Santa has a disease, only research can fix it”. The video has already been viewed over 100,000 times on YouTube and is approaching 500,000 on Facebook. Manchester-based Reason worked on the digital side of the launch campaign, creating a takeover landing page on RUK's website and working on the SEO and social media. It previously worked with ARUK last year to create the website itself.